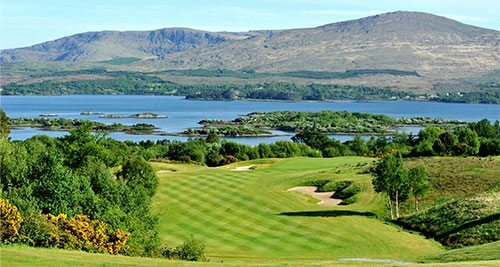 Ring of Kerry Golf Club is nestled between the Caha Mountains on the Beara Peninsula and MacGillycuddy’s Reeks, the highest mountain range in Ireland. This sand-based, 18-hole championship course is a unique mix of parkland and links that were carved into the moors that used to occupy the land. A tough course for professionals and novices alike, it is nonetheless playable, and enjoyable, to players of all handicaps. 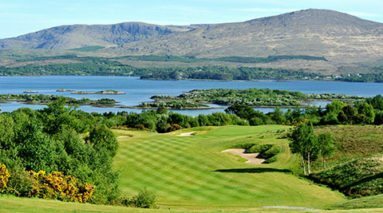 Stunning views of Kenmare Bay and the glorious mountain peaks form an ever-present backdrop that is best taken in from the 6th ‘Ladies View’ and 13th ‘An Neldin’ holes. Although the course is hilly in places, the views are worth every effort. The clubhouse has all the amenities one might expect from a top-level golf club. 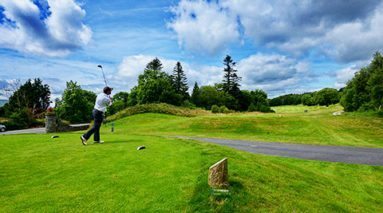 Its Pro shop stocks leading brands such as Ashworth, Lyle & Scott, Glenmuir all bearing the Ring of Kerry Golf Club logo, and it offers the golfer practice facilities to hone their skills before or after a day’s game. There is are an exclusive a la carte restaurant and fully-serviced bar in which to unwind with views of the club grounds and course that can only serve to further relax the weary visitor. The bar balcony has some of the best views of any clubhouse in Ireland. 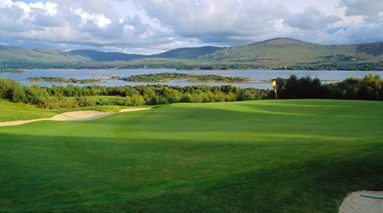 View the Ring of Kerry score card. 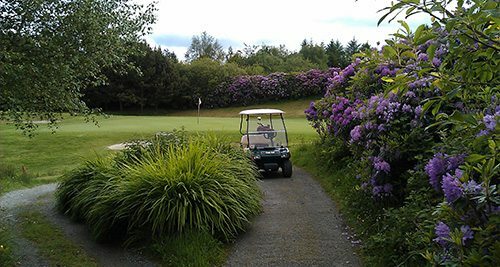 The nearest town is Kenmare which buzzes with two 5 star hotels, The Park and Sheen Falls. It has a number of other 3 star hotels, namely the Landsdowne Arms, Kenmare Bay Hotel, Brook Lane and Coachman’s Inn and numerous quality guesthouses. 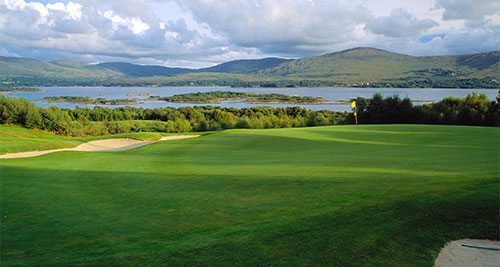 Killarney is only 30-40 minutes drive away, and it is the best option for accommodation in the south-west. Known as Ireland’s premier tourist town, Killarney has countless, top quality hotels, all a short walk from the town centre. Whether you are looking for a luxurious 5* Hotel, a comfortable 4* Hotel, a friendly 3* Hotel or a welcoming Guest House, Killarney has plenty to offer. For 5* you can choose the centrally located Killarney Park Hotel while the Hotel Europe and Aghadoe Heights are both located outside the town. If 4* would be your preference your options include the Malton Hotel, Randles Court Hotel or Killarney Plaza. 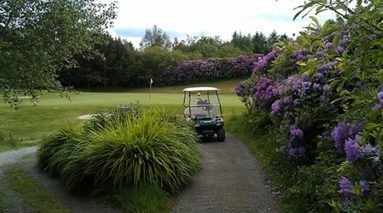 3* Hotel or Guest House selection can be made at McSweeney Arms Hotel, Eviston House Hotel, Fairview Guest House or the Killarney Lodge, all of which are only a short walk from the town centre. 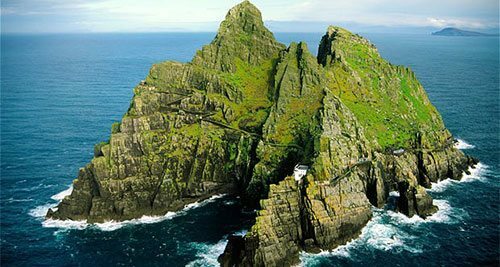 Lying on the south-east stretch of the Ring of Kerry is the picturesque town of Kenmare, a local hub of gourmet food, Irish traditional music and cultural charm. 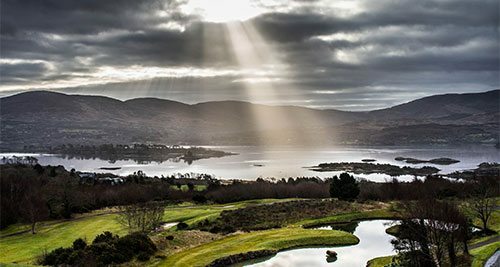 The village of Templenoe, home to the Ring of Kerry Golf club, is situated roughly 6 km away. Templenoe, though small, has a historic charm that far surpasses the limitations of its town borders. Dromore Castle was built here in the 1830s and its impressive Gothic Revival facade looks out over the passing Kenmare River. The Castle grounds are largely owned by the Irish Forestry Board and the Kerry Way passes through with various pathways that lead to the river. A short distance away lies the remnants of the older Cappanacuss Castle, built in the 15th century. Though little remains today, it is a reminder of the town’s history and one mirrored by the ruins of Dunkerron Castle, which stand in ruin nearby. Further insights into the Christian heritage of Templenoe and its surrounding areas can be seen in its 11th-century medieval church and the nearby Holy Well in Dromore. The Ring of Kerry connects a multitude of historical monuments and ruins that intersperse the scenic Kerry countryside.